Spring has sprung! 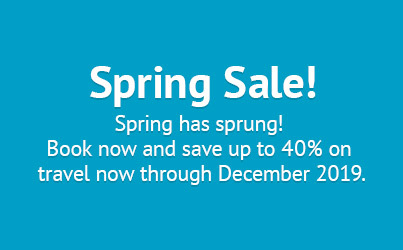 Book now and save up to 40% on travel now through December 2019. Valid on ALL room categories! BONUS: Receive US$20 spa credit, per person! Discounts vary from 10% to 20% for single occupancy and 25% to 40% for double/triple/quadruple occupancy based on travel dates. Offer is not combinable with any other offers or discounts. Discounts are not valid on extra person charges. Maximum 2 spa vouchers will be issued per room. Planning your 2020 getaway? Book now and save up to 35% on select travel dates in 2020. Valid on all room categories. BONUS: Receive US$20 spa credit for two! Discounts vary from 5% to 35% for double/triple/quadruple occupancy based on travel dates.